Five-columned kesa with decoration of Saga-style paulownia. 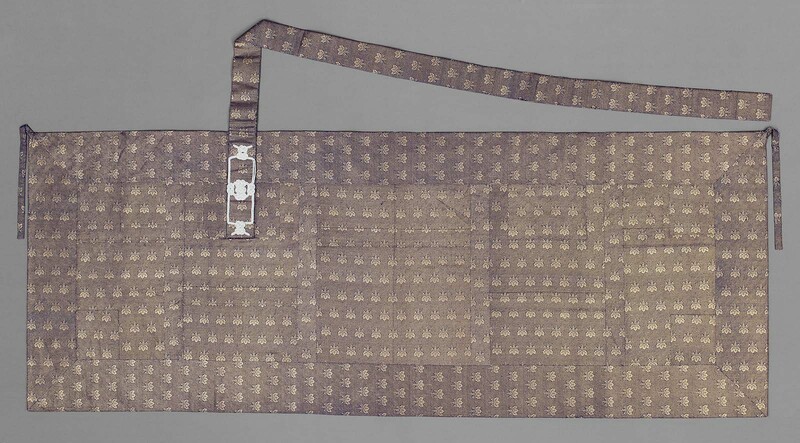 Columns, dividing bands, border, shiten, niten, braid: dark blue silk ground with woven-in patterns of Saga-style paulownia in supplementary wefts of flat gold-leafed paper thread. Lining: silk ground fabric of six-harness warp-faced twill with roundels of peonies, chrysanthemums, and wild pinks woven in a weft-faced twill.The strap is attached to the kesa with a decorative white braided cord.